“Afforestation with mix of local species of forest trees, reviving lost indigenous flora and fauna, conserving soil and water, protecting existing forest trees and generating revenues by selling residue free custard apples are few of the accomplishments of Payvihir village. The village had been felicitated with different internationally acclaimed awards. With prize money Rs. one lakh received from UNDP-Biodiversity Award and money earned from custard apple sales Gram Sabha of Payvihir village began funding the village development independently such as installing solar drip irrigation system on forest land, biogas plant etc,” highlights Ms. Purnima Upadhyay, one of the founders, NGO Khoj. It laid the foundation for transformation of Payvihir village. NGO Khoj first came into existence in 1993-94 by group of students from Mumbai interested to do something different for the forest and environment as well as assist the tribal communities to have decent life. It was later formally registered in 1996-97 and since then has been working tirelessly to empower tribal and save the nature. It works primarily in the Melghat region of Amravati district, Maharashtra. The region has two tribal blocks Dharni and Chikhaldara and another tribal settlement in adjoining Achalpur block. Payvihir is one such tribal village in Melghat region. Since last two decades Khoj NGO has been working in the areas like health, education, environment and improving livelihood of these tribes. “Precisely for past 4-5 we are investing time and resources on various laws that empowers tribal and forest dependent communities. We try our level best that the regional provisions can be converted into resources to make sure tribes are able to have self-supporting livelihood as well conserve the forest and environment in which they live in a sustainable way,” she adds. 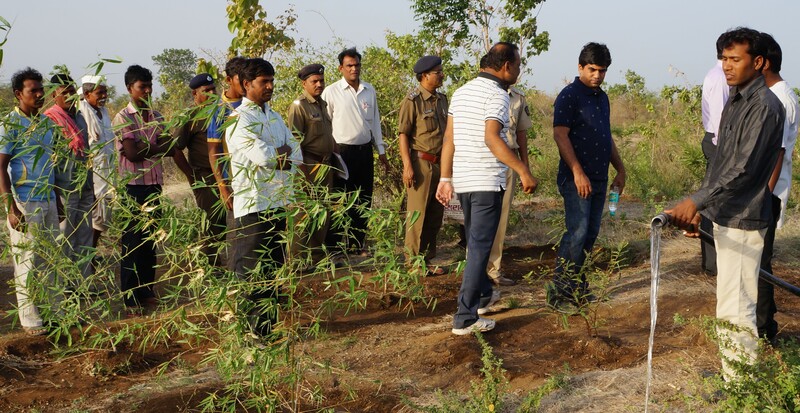 We associated with Payvihir village in 2010-12 to facilitate the process of claiming the rights to use the forest area. Under the Forest Rights Act 2006 (FRA), tribal communities are entitled to claim the forest area in and around their village to which they were associated traditionally for animal grazing, fruits, religious purpose, medicinal herbs etc. However, majority of tribes are unaware of their rights on the forest so were the people of Payvihir village. Thereby we helped them claim these rights. To begin the process, being dependent of the forest, tribes claims to manage the selected forest area on their own from the district level committee. After formal approval they attain the rights to use the designated forest area as they want. In 2012, Payvihri village acquired the rights under Community Forest Rights (CFR) to use and manage 192 hectare forest area surroundings the village collectively in a manner that the ecology and environment of forest area remains undisturbed and is managed sustainably. Gram Sabha of the village holds the responsibility to do so. In 2012, 192 hectare area was predominantly barren with an exception of few naturally grown custard apples trees. The tribe-villagers collectively began protecting and improving the designated forest cover. The focus was on safeguarding the existing trees, soil enrichment and conservation, prevention and judicious use of rainwater, and generating revenues without disturbing the forest ecology. The new plantation had a good mix of local species of forest trees that ensured food for human beings, birds and wild animals too. Names of few trees planted are bamboo, sitaphal, hirda, behada, mahua, mango, neem, custard apple, amla, jamun, teak and arjuna trees. As a result, with the blend of safeguarding existing trees and new plantation, by 2015 once the barren 192 hectare was converted into lush green forest. Birds and wild animals resumed their habitat in the forest. The ecosystem was reviving well. In 2016-17, the village undertook a remarkable project of selling organic custard apples collected from the forest. Earlier custard apples produced naturally in the forest were auctioned by the forest department at throw away prices but we encouraged the village folks to jointly start taking care of custard apples trees and sell the produce in the market. Village youth took up the project sincerely and performed all the tasks on their own like guarding the trees, harvesting, grading, sorting, identifying the market and end sales. Custard Apples were sold in local markets till Mumbai including cities such as Nagpur, Akola, Wardha etc. The profit earned was less but the entire process boosted their motivation level. It was a good learning experience for them and they could establish favorable network with the traders and buyers. Subsequently they initiated the process to generate revenues from other forest products too namely amla, mahua, charoli, bamboo, medicinal herbs etc. Further, convinced with the benefits attained from organic cultivation they started to switch from chemical farming to cow based farming. As they already had desi cows in their farm, the transition was not difficult. Currently they are trying to get the hold on traditional knowledge of agriculture by interacting with the seniors in the village. The forest trees yield is totally dependent on the climatic conditions hence tribal communities are now exploring new ways for income generation. They have started rearing desi cows and buffaloes for milk. The milk is sold to Mother Dairy regularly. To supplement their income we have introduced a new project of tendu leaves. We help the village to sell the leaves at the right price to the right buyer. Previously they were exploited by the middleman. In addition along with MNREGA (Mahatma Gandhi National Rural Employment Guarantee Act) we are ensuring there is continuous flow of work for the people of Payvihir. With collective efforts many positive changes have taken place in Payvihir village since 2012. Forest cover is improving each day, incomes are increasing, the youth are staying back in the village. They are quick learners and tech savvy thus are able to mutually install bio-gas plants and solar run drip systems in the forest. Apart from new modes to generate income and self-supporting lifestyle the tribal communities are wholeheartedly accepting the responsibility to protect and conserve their awarded forest area. We shall continue to extend knowledge and legal assistance to them for more fruitful transformation.